This video is significant in a couple of ways. Firstly, it is the first video on this channel connected to the time I was part of a community of listeners to a talk radio channel called Playradio UK. It involved such established UK talk radio talent s Tommy Boyd, Mike Mendoza and James Whale, but also burgeoned new talent from the co-presenters, as well as developing creativity on the part of listeners who contributed to the shows, one of whom was me. “It’s not a good thing to get a flu jab, anymore. We used to have an annual flu jab for all the family, as you can see going on here, but since the WHO has started to encourage countries to have enforced vaccination, it may be useful to know why this happens. You can look at a film by Jane Burgermeister and find out what has happened to the flu vaccine, especially the so-called swine flu vaccine. The swine flu is a relatively mild disease, killing fewer people than seasonal flu. Many countries currently reporting higher swine flu deaths are no longer reporting their usual seasonal flu deaths, simply reclassifying these deaths as swine flu deaths. Squalene, mercury, and contamination with avian flu virus has been found in the new mass vaccine. The items contained lead many people to believe that it is a eugenics weapon or “”soft-kill”” weapon being used to cull off large proportions of the population in stages over the next ten years, in order to delay peak oil, and also to social engineer the position of certain elite groups and families. They were not unlike these wikipedia ones, but on toast instead of bread and cheese. So here I am embarking on the first of many posts for this year. I woke up ridiculously late this morning, in fact I’m not sure that morning is actually the correct word to use, and the first thing that I thought about was to make sure that I drank coffee before breakfast because we had planned to use the red caviar that my wife’s sister recently brought from Russia for our first breakfast in the year. 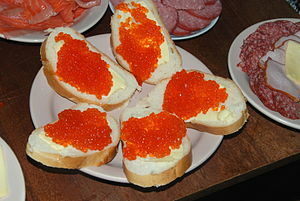 Now I don’t know about you, but personally I don’t like drinking coffee straight after eating red caviar. Or black caviar for that matter with the slight proviso that I don’t buy black caviar. I worry too much about the plight of the sturgeon, and also I don’t even like it as much as I like the red caviar which comes from the salmon, and is not endangered in the way that sturgeon-derived caviar is. It is a little bit endangered but then so is everything little bit endangered. Whereas sturgeons are more than a little bit endangered. So I took my coffee without sugar, and perceived on my weight loss initiative. I should say that I weighed in last night just before midnight at 131.6 kg. This means that in 2010 I lost the grand total of 0.4 kgs. Before you laugh and pour scorn upon my weight loss efforts, I have to say this is a bigger success than you might think. I am perfectly capable of adding on 40 kg in the course of a year just be eating what I feel like and not watching what I am about. So all I really need to do is redouble my efforts and there should be a healthy weight loss. Anyhow the target is 101,6 for the year – a loss of 30 kg. But I decided not to be weighing myself every day or week, I decided to make that a monthly event. For the first month to be on track I need to lose about 4 or 5 kg. It does slow down as a diet progresses, you see. I will not be crash dieting, just burning more by walking instead of using the car (which remains unrepaired while I get my teeth repaired, which appears to be a long-term construction project) and having smaller portions. 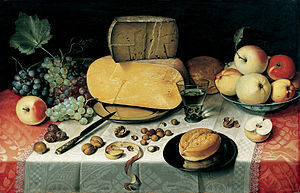 The key is to avoid the things which are simply empty calories, to eat less at meals so that I still think I probably haven’t eaten enough when I push away from the table, to leave food when given too large portions, to order fewer courses, and to drink water instead of juice or anything with calories in it. Calories taken in as fluid are a particularly deceptive thing – you don’t feel full but you’ve had some of your food allowance. Anyway, I did some Czech Goldlist and then went for a walk with my son, George. He is a bit snuffly so it was a short walk. The weather is about plus 2 outside but there’s a bit of a wind so the so-called chill factor was much in evidence. I listened to the Michel Thomas advanced Japanese course a bit while walking. I do think it’s very good despite some of the mean reviews it had on Amazon.co.uk. One person didn’t get on with the presenter’s Irish accent, but I find it quite endearing, so I do. I know Paddy O’Donohue would love it. He would probably be wanting Niamh to be his colleen if he wasn’t already wanting Enya to be. And then I came home and had some soup and one of my wife’s ‘kotlyety’ (Russian meatballs) and then it was now!